The Mini-timer is an adjustable panel mounted time delay device (normally closed valve). Timing is set by adjusting the front dial. The timer is equipped with 2 vertical scales that indicate the set time and the time remaining in the cycle (countdown time). To begin the timing operation, air pressure is applied to port one. 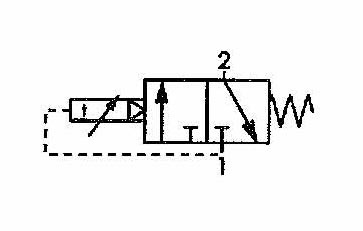 When the set time is reached the internal valve is switched over to provide an output at port 2. The valve remains open until the input air is switched off. Removing the air supply at any time resets the timer. The mini timer is constructed of a molded body with a clear plastic lens for viewing the scales. Ports, 10-32 (M5) are located on the rear of the unit. 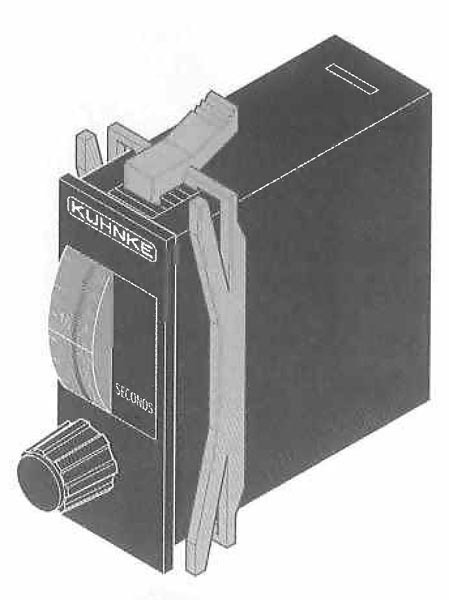 The timer is panel mounted with a built in retaining clip. 2 to 30 sec. 30 to 90 psi ± 0.3 Sec. ± 0.6 Sec. 20 to 300 sec. 30 to 90 psi ± 3 Sec. ± 6 Sec.